Last time, we went over some tips on how to prevent your site from spamming by filtering out spammers during the registration process. But the issue remains if the spammers are already active and engaging on your community. And now the real question is: How to isolate them and eliminate their chances to annoy others? Fortunately, phpFox has the perfect answers to this question How to stop spamming on your phpFox community. By integrating 2 effective tools, phpFox allows you to control and reduce bots/spam effortlessly.Let's go over these useful tools to see how they work! Spam Assistance Spam Assistance primarily enables some additional spam-check features to your community. 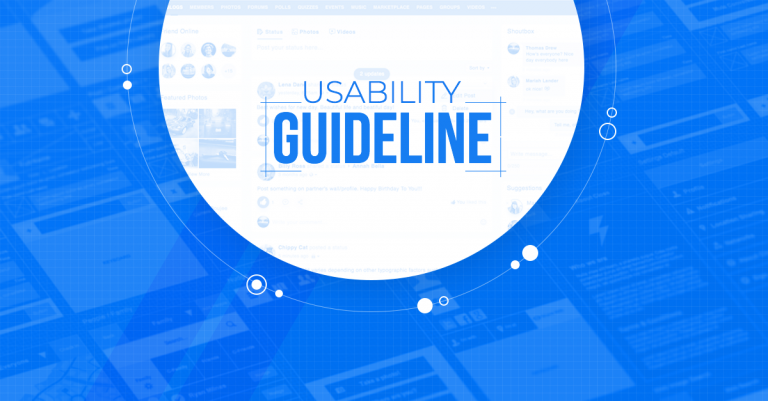 Admin has the flexibility to set a limit for each user behavior on site. From that preset standards, the system will check and mark any user with the violation. Then they will be temporarily dismissed from creating contents until Admin takes any further actions.To enable the Spam Assistance you will need to login to your AdminCP >> Select Spam Assistance under Settings menu.All of the features in this tool can help you to significantly reduce the amount of spam on your website. Admin can enable the Spam Checker and any additional checkers that will check posted comments from all users every few minutes and compare them for duplication. If there is any, this action will be counted as a spam instance from that user.Admin can also set a certain amount of comments a user can post in a period of time and whitelist URLs and emails that you have verified as safe.Above are some scenarios you can apply Spam Assistance to fight again spam on your site. Indeed, there are several other setting depends on your needs and demands. So go ahead and discover all these options and feel free to let us know if you have any inquiry about these. Ban Filter In most cases, phpFox supports you to detect the right spam target in a very clean and automated way. Ban Filter is a powerful tool for this. The setting offers options to allow the Admin to restrict the access to your community for certain members.To configure the ban filters you will need to login to Admin CP >> Select Ban Filters from the Maintenance menu. You can choose to ban certain Usernames, Emails, IP addresses, Display names, and Words.If you wish to ban a certain username from being used, you can do so by clicking on the Usernames section and then input that username. You can also manage all existing ban filters for usernames from here. Click on the Add button to add the username to the ban filter. Now when someone tries to make an account with that username he will not be able to do so.Please note this rule is also applied to existing users. If you selected Yes on Ban User option, this will not only forbid the use of such username but also ban the user that is currently using it. The same rules are applied for ban filters of the email and display name.When adding a ban filter on IP address, this will block all connections from that IP address to your website. If you selected Yes on the Ban User, this will automatically ban all existing accounts from that IP.When you add words you wish to ban, you can choose a replacement for the word. This will replace all instances of that word on the entire website. This is an awesome feature if you want to restrict bad languages on your website. Again you can choose if you wish to ban the users that use that word or only to replace it. That's it. We hope with these 2 compelling tools: Spam Assistance & Ban Filter, your community will have an additional protection shield to fight against spams. Your site will be more reliable and full of useful contents without all the spams.We appreciate all your feedback. So feel free to let us know your opinions on these tools to make them better! Social networks are becoming a popular way for internet users to communicate and interact online. People spend hours and hours on Facebook, Twitter, Instagram, etc. to talk to friends, read the news, discuss events... Unfortunately, this popularity also attracts a significant amount of spammers who continuously expose malicious behaviors. These behaviors lead to misunderstandings and inconveniences on users' social activities. As the leading solution in building Social Network, phpFox comes right out of the box several tools and options for spam protection on phpFox. In this part 1 of the series, let's explore on how to get these tools and setting activated to prevent spammer to activate on your community. 1. Email Verification The easiest way to eliminate spam is to make it harder for spammers to join in your network. After registering, to be able to login to your network, users have to activate their accounts via a link in the verification email. This solution adds an extra layer to prevent your site as only real registered users can pass this check.To setup Email Verification, firstly you need to make sure you have correct Mail Server setting which is able to send out emails. Then from AdminCP >> Settings >> Registration Settings >> Turn ON Verify Email At Signup. 2. Captcha Another method to prevent spam bots to disturb your community is to use Captcha. Basically, captcha is a set of required actions which users have to do before performing any action such as register account or post a thread in Forums… By distinguishing human and computer bot, Captcha eliminates all security threats which come from malicious and automated programs. phpFox supports the use of 3 captcha types. Depend on your site’s audience, you can choose the appropriate captcha type which is the most convenient for your users. Basic Captcha A combination of letters & numbers which users have to type in to be able to proceed. reCaptcha The captcha technology by Google. It requires users to click on a certain area as instructed. QR Code phpFox will generate a random character combination in form of the QR code. Scan the code with your phone to reveal the verification code.You can read our guide to enable Captcha. 3. Anti Spam Question This is another solution to get rid of spammers before they can bug out your community. Indeed, adding Anti-spam question and creating your own answers is extremely effective on niche social networks. As you can create a question which is only applicable to your niche community. For instance, the capital city of different states in your country or set the question in another language rather than English. This will totally trick the bots and spammers who are not familiar with your network.For detailed instructions, you can follow our guide to enable Anti-Spam Questions. 4. Approve Users Manually On Registering This setting enables Admin to have the privilege to review registering users before they can be active on your community. After registration, the status of the users will be marked as Pending until Admin approves their memberships.To set up this option, go to AdminCP >> Settings >> Registration Settings >> Turn ON Approve Users. 5. Force Users to Upload Profile Image when registering Force users to upload profile image while registering guarantees false registrations cut back to a manageable amount. Overall, any registration instance has to perform manually, just because it is truly hard for spammers or bots to accomplish this step automatically.In addition, with this setting enabled, users will have a better and more completed profile right after registration.To set up this option, go to AdminCP >> Settings >> Registration Settings >> Turn ON Force Users to Upload Profile Image. We just introduced very first 5 solutions that you can configure quickly to prevent your phpFox Community from Spam. Let try them all today and share us your experiences. PS: We will get back with more solutions on phpFox Core soon. In phpFox 4.7.1, we pushed an important update as a powerful supplement to phpFox Homepage (or Landing page). 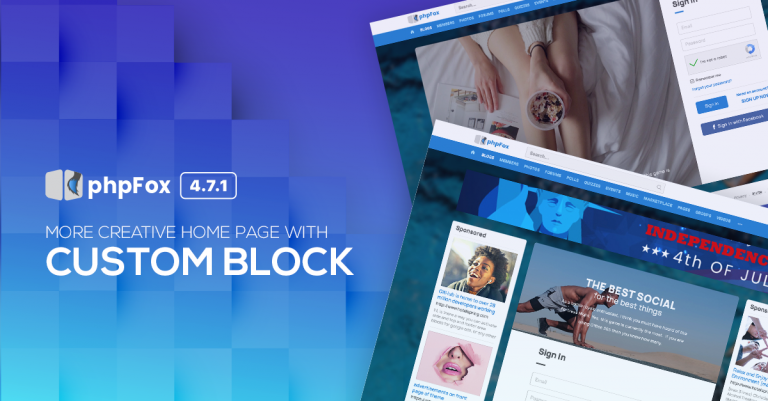 As now you can design and customize the whole creative home page with custom blocks. Let's take a look into how we can renovate phpFox Homepage on phpFox 4.7.1 now!It's not an exaggerating to say that the homepage is one of the most important pages on a site. It serves three significant key purposes, all with equal importance: – Attract and captivate visitors. – Educate visitors on your brand and objectives. – Encourage visitors to view other pages on your website. In other words, the homepage serves as the first impression for new visitors. And generally, it will be the page that lands the most traffic. With this in mind, we have put several efforts on tweaking and perfecting phpFox home page. We firmly believe that the ability to add blocks will guarantee your site a beautiful and persuasive homepage. As the guidance to walk you through on how you can take advantage of this compelling upgrade, below we are suggesting some examples layout that you can apply blocks to phpFox Homepage.Note:We are working on the Material template as an example. Any other template may require different setups, but the block orders still display accordingly. These layouts aren't shown by default. We just suggest you ideas on how to set up your home page, but you can have your own setup based on your creativity.Just like any page in phpFox, the homepage also has a 3-columns layout. From left to right, it's marked as Block 1, Block 2, and Block 3. Additionally, there is a header block (Block 11) and a footer block (Block 8) for you to customize.Please note that the home page is Visitor Landing Page (core.index-visitor). Sample Home pages with custom blocks. 2-columns Layout3-columns LayoutThey're so amazing, aren't they? Now it's your time to setup phpFox Homepage, share and inspire others to build beautiful homepages.Having any questions about this feature? Please don't hesitate to let us know by writing to hello@phpfox.com. Since the release of phpFox 4.7.0 last week, we are delighted by all the love and support through loads of feedback and suggestions from you. As committed to completed satisfaction from clients, we truly appreciate and welcome all your constructive opinions and inputs, as these greatly inspire and help us in the process of perfecting the platform. On top of many positive feedbacks, we also received some reports about issues while upgrading to 4.7.0 and this may make you have concerns. To make sure the upgrade process goes smoothly on your side, we will now cover some frequent problems in common scenarios so you can prepare in advance and have a successful upgrade. 1. Should I upgrade when my site has only Core apps? → All Core default apps are fully compatible with phpFox 4.7.0 now, indeed all Core apps are already upgraded to work well on this new versions. Therefore, you can just go ahead and upgrade immediately. However, it is important to note that some apps such as Pages, Group, Activity Point, Messages, etc. are only compatible with phpFox 4.7.0. Please don't forget to upgrade all phpFox apps to their latest versions along with phpFox Core upgrade to prevent any compatible issues. 2. Should I upgrade when my site has only Core apps and some were customized? → When it comes to customization, the situation turns to a little bit complicated. The customized apps may need to be merged with the newest source code manually to avoid any missing or bug. If your site was launched, then you shouldn't apply the codes directly to your production site as it might cause unexpected malfunctions and conflicts which potentially crash your site. We recommend you to build up a development environment for this upgrade then perform the upgrade on this so you can test and fix bugs first. Once the development environment works smoothly without any issue, it's time to deploy source code to the live site. 3. Should I upgrade when my site has 3rd-party apps? → First of all, please make sure that all 3rd-party apps you wish to use on your site have to be compatible with phpFox 4.7.0. The risk of applying and using an incompatible app may cause your site down. So even you really want to use the apps, we recommend you to wait until all apps are checked and fully compatible. In case you are in rush, please contact 3rd party providers/experts to schedule the upgrading plan for the apps. 4. Should I upgrade when my site has customized 3rd-party apps? → This situation is the same to above, we recommend you to check for app compatible first regardless it's customized or not. Again, in case you are in rush, you can always contact 3rd party providers/experts to schedule the upgrading plan for the apps. Third-party experts can have good advices for you to upgrade customized apps as well as merge old custom work then. Moreover, it is always the best practice that you should have full backup your site before proceeding upgrade. When starting the phpFox upgrade, it is highly recommended to temporarily disable all 3rd-party apps to avoid compatibility issues. After upgrading your phpFox Core and default apps successfully, you can move to upgrade and enable 3rd-party apps. Upgrading your Production site should be taken place during low traffic time. Ideally, it's around midnight and 5 AM, but it's not right to all industries and you have to adjust accordingly. Hopefully, these walkthroughs on scenarios above will clear up of your concerns and help you in the process upgrading your site to phpFox 4.7.0. Feel free to let us know if you have any inquiry about the upgrading process and also about the platform so we can improve phpFox better through future releases. Let contribute your thoughts and ideas by emailing us at hello@phpfox.com. 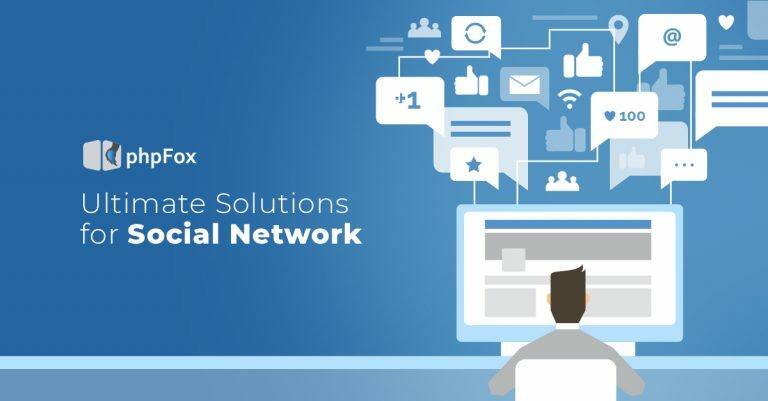 "Ultimate Social Network Solution" - this is what phpFox is all about.People nowadays are so familiar using Facebook, Instagram, Twitter, LinkedIn, and other big social networks out there. But did you know that you can also build a Social Network? Have you ever thought of becoming a CEO of your own Social Network site? It is possible with phpFox.With phpFox's ultimate solution, that doesn't require any technical knowledge, you can bring your social network ideas into reality. Whether you want to clone a social network like Facebook or create a unique online community store, we can help you. 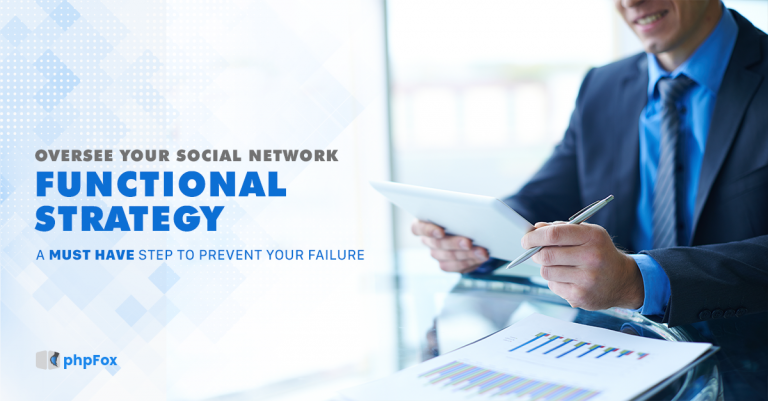 Here are the things you need to know:Social Network Functionalities. In phpFox, you can choose from three different packages with default functionalities. It includes all the essential features of a social network. Some of the best features are Blogs, Forums, Marketplace, Subscription, and Ads. See the complete features for your yourself. Clean and Attractive Design. phpFox software comes with two designed templates. The Bootstrap and the very latest and most outstanding template, the Material Template. You can either choose Bootstrap or Material Template to use it as a default theme on your site. These two templates are fully customizable. Customization and Extended Plugins. When you buy a phpFox script, you will have a 100% full access to the codes giving you the power to fully customize your site. You can also reach out to our 3rd party experts if you are having any difficulty in customizing your site. You can also search free and paid 3rd party plugins, themes, and language packs from the phpFox store and use it on your site. Fast and Reliable Support. phpFox software has an online User Manual or Documentation Center where you can find tutorials or how-to steps in order for your site to be up and running quickly. You can also join the Community Forum to read and share ideas with other phpFox users. Last but certainly not the least, the phpFox Helpdesk Support. You can easily submit a support ticket in your client area whenever you encounter any issues on your site. You can read the support details at phpFox Support Policy. Mobile Apps (IOS and Android). This 2018, phpFox will have its very own native mobile application. We will keep you updated about the progress on our future blog announcements.In the meantime, you can check some of the mobile apps developed by 3rd party experts First-class phpFox Services. Worry no more with our complete phpFox Services. We provide these services to everyone but most especially to those who don't have any technical background. You can just sit back and relax while we set up everything for you. From designing your website, server setups, software installation up to initial configuration, we will do the works. Just choose the most suitable package and we'll do the rest.Now when you want to create an online dating site, build an online shopping store, or bring your ideas into a social network site, all you have to do to get started is to find a hosting provider (see phpFox Hosting and Recommended Hosts) and select any of the phpFox packages. You can also ask our live chat agent on our website or send an email to hello@phpfox.com and we'd love to hear from you. How to make money in Social Network? Have you ever thought of having your own Social Network? Do you imagine yourself how it feels to manage a famous website like Facebook? How about building your own community for professionals like LinkedIn? There are lots of popular Social networks out there but what do you think is the reason they are getting bigger and better every day? What do they get in return?People have their own reasons why they want to build a Social Network. Some just want to connect people by building a niche community. And others want to monetize or make money from it. 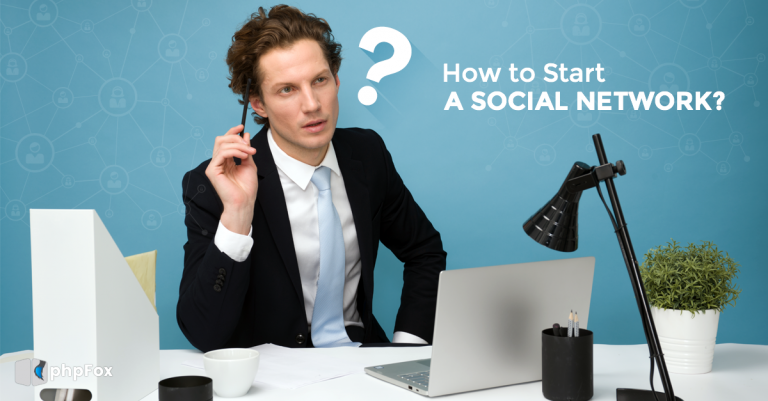 The question is, how can you make money from Social Network? Alright, now you're in. Let's talk about money. We will show you how you can generate income from a social network. But in order to achieve that, you have to be proactively promoting your site. There are lots of ways you can do to promote your site. And this is very important in order to have your site gain popularity and achieve your desired target number of members. The more members your site have, the bigger income your site will get. We will also try to give you some ideas on how to grow your community in a different article. But for this one, we will focus on how you can make money from it.We have a lot of successful clients running social network sites using phpFox script who are actually earning not just hundreds but thousands of dollars from maximizing the monetization features of their site. What are the features to monetize your site? In phpFox, we didn't just build a script with the essential features of a social network, we also made sure that it has a lot of features you can use for monetization.The following are some of the proven features used for generating income in a social network. AdsIf you're managing a social network, it will be easy for you to allow your members to run Ads on your site. You can allow your users to create ads and you will have the full control on how much these ads would cost. If you are running a social network with members all around the globe, Ads will be definitely beneficial to your users who want to showcase or promote their products or services in a specific location, with specific age range, or type of people. With this feature, your site will automatically generate an income by allowing your users to leverage the usage of Ads. SubscriptionAnother feature to consider in monetizing your site is a Member Subscription. As an owner, you can define the access level of your members on your site. Old members who are already familiar with your site can easily choose if they want to stay as normal users or wants to upgrade their membership to a paid one with full access to your site. But you'll have to accept the fact the newbies will register on your site and choose free membership. Members subscribed under the free membership level has a limited access on your site.As mentioned earlier, you as an owner have the power to set or define the access level of your members. As a result, setting limited access to free membership will make them decide to subscribe to a paid one or a VIP membership level to fully access the functionalities of your site. This clearly shows that your site will generate an income through the subscription process. MarketplaceThis feature allows your users to buy and sell items on your site. The seller can easily create their own listing and set the price for the product or item they sell. The buyer can easily contact the seller whenever they have questions regarding the product in the listing. The buyer can also directly purchase the product or item in the marketplace by activating the Buy Now button. But how can this feature benefit your site?You can actually allow your sellers to purchase a sponsored ads space in the marketplace. As an admin, you can set the price for each sponsored ads. This way, the product or item of the seller on sale will be displayed on top as a sponsored item and will be easily noticed by the buyers. Purchasing sponsored space in the Marketplace could bring the seller more sales so they will more likely to purchase the sponsored ads space wherein your site can earn from it. EventsEvent in any form is one of the very important factors in a social network. It can use to set up a simple meet up or create big parties. It can give your users a chance to organize a specific event to showcase their products or services for example. As an Admin of the site, you can create a specific UserGroup that allows creating events. In order for your users to join this specific user group, they will need to subscribe by paying the membership fee or be promoted by using the activity points. Event organizers can also look for sponsors who could finance the promotion of their event. One way of promoting an event is by purchasing ads space. In return, the event organizer will feature their sponsor in the said event. It's like an X-deal for both organizer and sponsor while your site generates income from it. Activity PointsThis feature plays a big role in the phpFox social network. Enabling activity points will allow your users to gain points in all their activities within your site. It could be earned by creating blogs, commenting on a post, creating a new item, etc. These activity points can be used to purchase items within the site or also be used to be promoted to a specific user group. The users can be promoted if they reach the required points. Users who don't have enough points can purchase activity points in order to be promoted and to be subscribed to a membership or to purchase an item.All of these features mentioned above are just some of the ways you can do to make money using Social Network. You can check out the monetization page on our website to learn more about how you can generate an income when you own a social network website. You can also contact us for more information and we will provide the best solution for your social network project. Purchase your own license now and start earning.